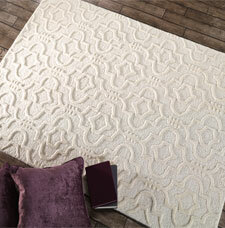 Moorish is a fantastic collection of stunning handmade North African inspired wool rugs. The rugs feature a variety of construction techniques such as hand-carving, multi-layering, and plush cut & loop pile; all of which help to create outstanding three dimensional effects. In addition, the rugs are made of pure wool and they also use neutral colours that are suitable for any room setting.